Sometime after the end of the 1914/18 war my Mother’s eldest brother, my Uncle Will, came to live with us, in the middle room downstairs. He had been wounded (? in 5 places) while serving with Allenby’s troops in Palestine and, much to his disappointment, he had been invalided home just before the entry into Jerusalem. I can remember a photograph of him my mother had for some time, dressed in khaki, with puttees around his legs. Very pale and serious. He had brought back with his souvenirs a small model, in ivory, of the Taj Mahal, which was of great interest to us all, we had never seen anything quite so beautiful. I do not remember what became of it. Nor do I remember how long he stayed. [He later married a Scotswoman who made him change his name by deed poll from Baggs to Pierson as she refused to be called Mrs. Baggs. Uncle Will became headmaster of Launceston School, Cornwall, and was buried there. There were no children and his wife went back to Scotland, I think. I remember seeing her—probably at the wedding or soon after—but I think that was the only occasion. My mother gave me Uncle Will’s bible when he died (1932)—she thought I took after him and she thought highly of Uncle Will. What do you remember—if anything—about your Uncle William Walter Pierson? Well, my earliest recollection of Uncle William was when he came to stay. My mother looked after him, after he’d been wounded, during the First World War. He had been with Allenby’s army, in the attempt to reach Jerusalem; and my uncle was wounded—I think he got about five bullet wounds in his back—the figure five sticks in my mind, I think it was in his back. It may have been pieces of shrapnel, but he was certainly wounded; he never got to Jerusalem, much to his great dismay—he was looking forward to being able to get into Jerusalem, but I think somewhere outside Jerusalem, he was wounded, and invalided out of the army. I remember him around the house, looking very pale—I think he must have been fully discharged from hospital—and he was well on the road to recovery, but he was always looking very pale. He had the middle room on the ground floor, to himself, and I suppose we were all kept fairly quiet, so as not to disturb him too much. But he stayed with us until he was well enough to go, and establish himself in other quarters—he wasn’t married at that time. He was a schoolteacher—had been before the War, and went back to teaching. One of my recollections of him—that, in his travels in the Middle East, he had acquired an ivory model of the Taj Mahal, which he kept under a glass dome in his bedroom—he used to show it to us with great pride, and we had to be taking great care of it. I never knew what happened to it, but I suppose he took it with him when he moved out of the house. When he did marry, it was probably left with his wife. He came to stay once or twice—at Christmas time—I seem to remember one Christmas, we had both my Uncle Will, and my Uncle John, and my grandfather Baggs, all staying at our house, over Christmas; I think it was only one occasion that happened. I think I may have met his wife, Mrs Pierson, either at the wedding, or just soon after the wedding, at our house; I never saw them again, after that. He was established at that time as headmaster of a school in Launceston, in Cornwall; and we never got down that way to see him. I think my cousin Norah, and her father Uncle John, must have called on him, at some time or other, while he was there, ’cause they could get around, they were more mobile. Well he changed his name because his wife refused to be called Mrs Baggs. She couldn’t see herself being able to uphold her dignity against the other mothers of Launceston, if she was Mrs Baggs. So she insisted, she would only marry him if he would agree to change his name. I don’t know why they took the name Pierson—whether it was her maiden name, or was a part of her family name. My mother didn’t feel it was quite right, I remember, but they had to accept it. You can understand—can be embarrassing. She was much more of a dominating personality, he was very quiet and retiring, and refined. How much it was due to his war injuries, or not—but he was a very scholarly person. I WALTER WILLIAM BAGGS, of School House, Otterham, in the county of Cornwall, Schoolmaster, hereby give notice, that I have assumed and intend henceforth upon all occasions and at all times to sign and use and be called and known by the Christian names and surname of Walter William Pierson in substitution for my present Christian names and surname of Walter William Baggs, and that such intended change or assumption of name is formally declared and evidenced by a deed poll under my hand and seal dated the fifteenth day of May, one thousand nine hundred and twenty-six enrolled in the Central Office of the Supreme Court of Judicature. In testimony whereof I hereby sign and subscribe myself by such my intended future name.— Dated this fifteenth day of May, 1926. Mr. Walter William Baggs, who has been Headmaster of Otterham Council School since 1920, has been appointed Headmaster of Launceston Council School, in succession to Mr. W. Atkins, who retires in May next. Mr. Baggs served his apprenticeship as a pupil teacher in the Prison Officers' Boys' School, Portland, Dorset, and, as showing the change which the years have brought in educational methods, it is of interest to note that at that time pupil teachers had charge of a class all day, and had to do their study in the evening. During the six years' apprenticeship the pupil teacher had to be at school at 7.15 every morning, and study under the supervision of the Headmaster. After two years at the Winchester Training College, Mr. Baggs became an assistant master in Gillingham, Kent, and in 1908 was appointed First Assistant at the Wadebridge Boys' School. In September, 1914, he joined the Territorials, and with the 1/4 D.C.L.I. set sail for India in October, 1914. Following the fortunes of the battalion, there was a stay in Aden of one year, and then service with the E.E. Force in Egypt and Palestine until April, 1918, when he was wounded. Leaving the Army in 1919, he went back to his old school at Wadebridge, and in 1920 was appointed to the Headship of Otterham County School.
. . . I did see quite a lot of Auntie Maggie, but—she was living—most of the time I remember—at Canterbury. 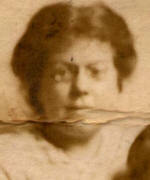 Her husband, Uncle Arthur, was the manager of the Pickfords’ office—removal agents and travel agents—in Canterbury. I can’t remember seeing them, until I was about twelve, when I went to Canterbury to stay for a week, with Uncle Arthur and Aunt, and my two cousins; . . .
Aunt Maggie was rather like a slightly older edition of my mother, and very homely, very friendly. We fitted in very well with her, we got on very well. I think she can’t have had a very happy married life with her husband, Arthur, who was a much more well-educated, well-read, person, quite a strong character—he was very quiet, and I think very shy, in many ways. I remember my mother saying that her sister Margaret had had a quite unusual courtship with Arthur, that he used to declaim poetry to her, all the while they were out walking. He had a great memory for poetry, and very fond of poetry. He didn’t seem to take a great deal of interest in his children, Oliver and Clive, he left it all entirely to my Aunt Maggie. I think she found it a bit of a handful, having to manage them on her own, without any real assistance from Uncle Arthur, who was more interested in retiring to his room, and reading his books. He became very interested in Christian Science, and tried to convert her. He always took the Christian Science newspaper, and went to their meetings very regularly. But she was much more a traditional Methodist; but then she became very influenced by the Plymouth Brethren or the Seventh Day Adventist, or one of those evangelical bodies. I remember on one occasion she took me to one of their meetings, hoping to convert me, or to get me interested in it. I can’t remember the biblical text, I know it may have been from the book of Daniel, but there’s a section about the great statue with feet of clay, that occurs in the Bible, and the whole sermon on that occasion was about this statue and how all the predictions that were recorded in this passage were all coming true. They went through them one by one—and how they all foretold the last day of judgement was nigh, and they had to be prepared for it. I thought at the time, what a lot of bosh this all is, but, being with my aunt, I didn’t want to upset her, and held my peace. They moved, later, to live over the office itself, or the shopfront, in the centre of Canterbury, not far from the Cathedral—very strategically placed for custom. Later they moved to Croydon. Uncle John had been in the First World War. He certainly had been in training for active service, he might have been reservist, but I don’t think he actually saw any actual service on the First World War; but certainly he was in the forces. Anyway he had learnt to ride a motor-cycle. My Uncle John, of course, was living in London; and we didn’t see a great deal of him, until I was ten to twelve, I suppose—I may have given the time in my notes, in my diary. I know he had a motorcycle and a sidecar combination, AJS. He came down to see us when we were living in Marlborough Road, Gillingham, with his goggles, and helmet, and warm clothing; and my Aunt Grace and my cousin Norah in the sidecar. I think that was the first occasion I met my cousin Norah. I remember she rang the bell or knocked on the door, and I went to the door and saw this young little girl there, very bright, chubby, round faced girl there, she says, "Hullo, I’m Norah," and I didn’t know who Norah was. We weren’t expecting them; they’d just come out for a day’s run and thought they would call on us. As a result of that visit, I got an invitation—I think it was pre-Matric year, at the grammar school, in the summer holidays. I went to stay with Uncle John and Aunt Grace, and Norah, in Wandsworth, near Putney—and I spent a week there, and got to know them very well. . . . They had a pleasant house, in Wandsworth. . . . The only other thing I remember, that was my first introduction to "high living"—with our first midday meal, they served fizzy lemonade, in a glass; we never had fizzy lemonade other than from a bottle when we were out, for treats out of doors, when we were on picnics, and so on, as a special treat; but to have lemonade as a regular drink at mealtimes was quite luxury living, as far as I was concerned! And he taught in Wandsworth, did he? He taught, yes, in Wandsworth, in that area, I can’t remember the school—Southfield’s, I seem to remember, rings a bell. His school was evacuated during the early days of the war, down to Broadstone. . . .They stayed at Broadstone the whole time, they never moved back to London after the war. Even though the school presumably did come back to London? This page was last revised on 2018-05-09.